Idan Computers, based in Israel, offers image analysis solutions that take advantage of any kind of ortho or oblique photos. Back in 2003 the company offered a desktop solution, Oblivision, (GIS Monitor coverage, pdf) and now offers a browser-based version. Directions Magazine caught up on the 10 intervening years with Joseph G. Freund, president and CEO. Directions Magazine (DM): Essentially, you’ve ported your desktop Oblivision solution for getting the most out of oblique images (measure distance or area, find oblique images that relate to a point on an orthophoto, etc.) to the browser. [Readers can test the software here.] How complex a task was that? Aside from the interface changes, are there any features that differ between the desktop and browser versions? Joseph Freund (JF): Using the same algorithms and code, it was quite straightforward. The most difficult parts were achieving the same speed of zooming and managing the images on a remote server. DM: Oblivision for browser is not for sale to end users but rather to a "aerial photography firms, photogrammetric service providers, and related industry players that aim to extend their added-value product offering.” How does that work? JF: Oblivision (both desktop and the Web version) is a viewer that adds "intelligence" to oblique images. It is a justification for more and more people to use oblique images, and it is a tool to help the image providers to sell their product. A typical oblique camera system is over $500,000 and there are not too many owners of such cameras at this moment. That’s something I hope it will change. The owner of the camera buys from us one copy of a special software called Bundler. The Bundler adds the metadata to each image, and then those images are sold to the end users, with the viewer. The desktop viewer is installed per seat, or on a local area network (LAN) as a site license. This solution is suitable for a limited audience and needs an installation of the software on the end user's side. The Web version (the viewer) saves the need to handle multiple copies of software, install, maintain, update and, of course, pay for each copy. It is for an unlimited audience and can be used from any browser. Another advantage is that the images are stored in one place, and they can be updated easily. With the desktop version, the user has to have the images on his computer (or LAN server). DM: Where are the imagery and image analysis tools stored in an Oblivision for browser solution? At an end user's local or hosted server? On the reseller’s server? In the cloud? JF: Both the data and the application can be stored on any server, and there is no need to have any third-party software like ArcGIS server, etc., but of course ArcGIS is supported. DM: Once a user identifies a location of interest in Oblivision for browser, a quartet of oblique images showing that location appears. But the images come in via several passes, getting more detailed with each pass. What’s happening there? Is that an image pyramid in action? JF: We have developed our geocoded tiles both for the oblique images and for the orthophoto that is practically unlimited in size. DM: There are two levels of Oblivision for browser which can be selected in the settings: Basic and Professional. What’s the difference between them and why did you decide to offer these two interfaces? JF: The full benefit comes when using the professional version. However, we had comments from some first-time users that the four images are confusing them, so we decided to "simplify" the user experience (UX) for them. Our experience is that after a short while, they typically switch to the professional version, to fully benefit from the software. DM: Are there any other things you want to share about the Oblivision products? 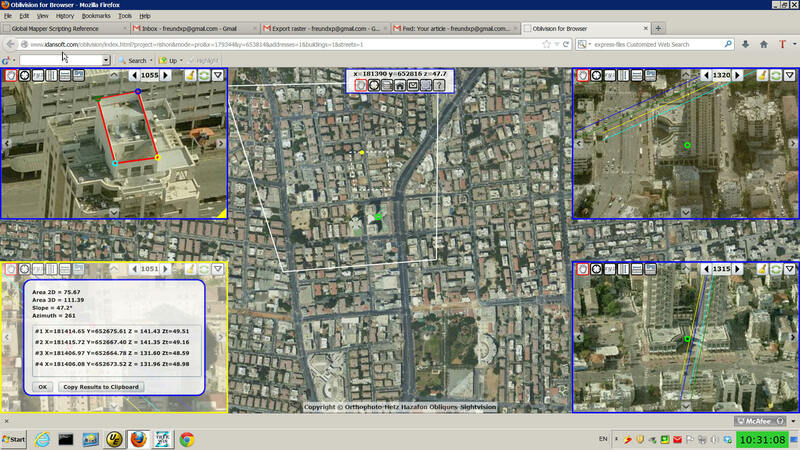 We support both tiled and dynamic layers from Esri ArcGIS Server. We can provide the ability to edit GIS data directly over oblique images, but decided to leave it outside the packaged software. We support English, Russian, Japanese, Chinese, Dutch and Hebrew. The data, of course, can be in any language. Figure 1: Oblivision includes the ability to accurately measure a slanted slope. It’s one of the most popular and hard to achieve features.